What if your kiddo isn’t ready? 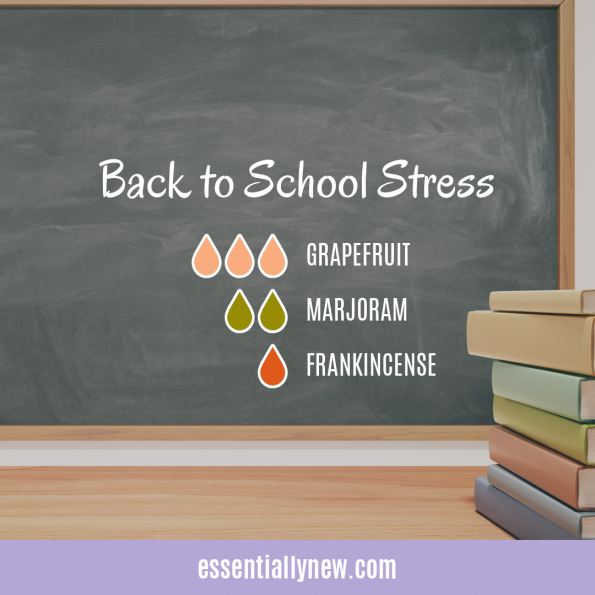 This recipe is to help with those anxious moments getting ready for school. It’s a little peppy and grounding at the same time. Just enough to refocus and calm down and turn that anxiety into (a little) excitement! You can use this recipe in a few different ways. Add this recipe to a roller bottle and top with carrier oil. Roll on the chest and wrists. I normally only roll on the chest because it’s so convenient for inhalation, but kids also keep their hands near their face and it’s also another good spot for inhalation. Make sure your child is old enough to not rub their freshly-oiled wrist on their nose, eyes, or mouth. Or, you can double this recipe and add to a personal inhaler (plastic version here). This is recommended for kids old enough to know how and when to use it, maybe 7 and up, depending on the child’s maturity. Or you can diffuse in the morning before school. Depending on your diffuser, this may be a master blend. This is my favorite large diffuser (good for large rooms, you could double this recipe for this diffuser), and this is my favorite small diffuser (good for bedrooms, but you can only use 2-3 drops, so this recipe would be a master blend to use a couple of times). I’ve had both of these for 3-4 years and they still work like a charm!